Derek’s awesome lil’ brother and sister just turned 16 and 18. (October 30 & 31st) They both love the combination of chocolate and peanut butter. Who doesn’t? 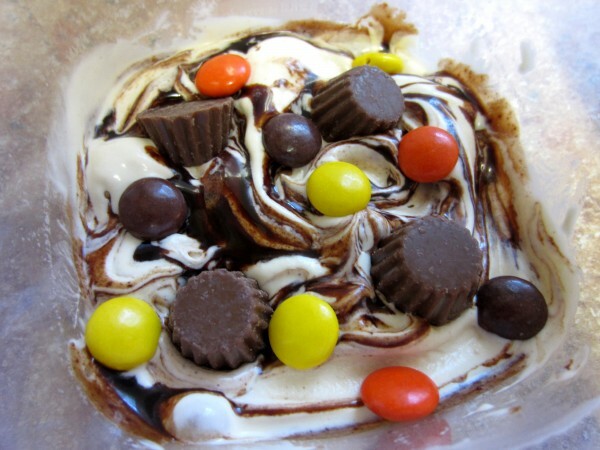 So I made them this amazing ice cream! I recently shared with you my new favorite ice cream, Blackberry Ice Cream. It was so amazing that I checked out the book it came from at the library, Sweet Cream and Sugar Cones. This book is written by the owners of Bi-Rite Creamery in San Francisco. It’s a very popular ice cream spot and they are so amazing to share their recipes in this book! I bookmarked half the recipes and just might have to buy this book! To make this ice cream you basically make a custard base with heavy cream, egg yolks etc. (The egg yolks are cooked through so no worries there.) Then you add it to the peanut butter. When I was making it I felt like I was ruining it by adding it to the peanut butter since it seems like such a fancy ice cream base and peanut butter is not very fancy. But boy was I wrong! I didn’t think I would love peanut butter ice cream but oh my goodness! 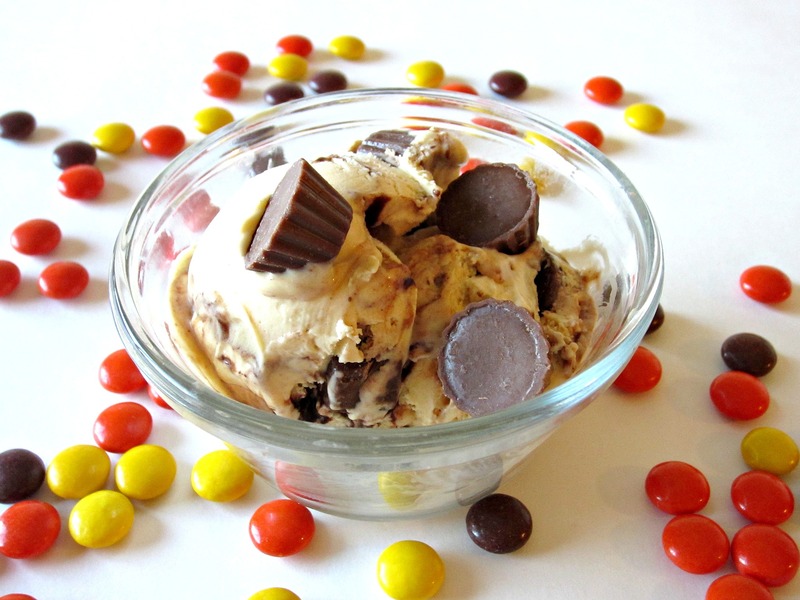 This recipe makes peanut butter ice cream amazing! It’s smooth and creamy and just heavenly! 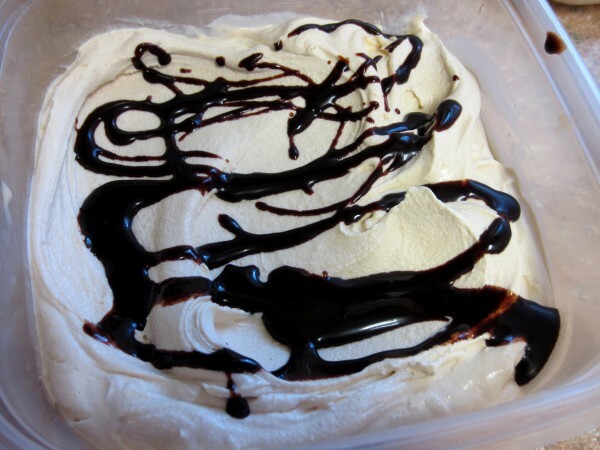 When it’s ready you add a couple spoonfuls of ice cream to the container you are going to put it in then you drizzle on the fudge and swirl it in with a knife. Then if you want you add in any toppings you’d like. I added in super cute mini peanut butter cups and Reese’s Pieces because my sister-in-law loves them! Then you repeat the layers. I loved this ice cream and can’t wait to try more and share my favorite recipes with you! If you don’t have an ice cream maker… go buy one! 🙂 It’s so much fun! In a small saucepan, whisk together the sugar, water, cocoa, tapioca syrup, and salt and put the pan over medium-high heat. Whisk frequently as the mixture comes to a simmer. When the sugar has completely dissolved, remove from the heat. Add the chocolate and let sit undisturbed for a minute to allow the heat of the syrup to melt the chocolate. Whisk until smooth, then whisk in the vanilla extract. Transfer to an airtight container and refrigerate until completely chilled. Use the ripple cold. 1. In a medium heatproof bowl, whisk the yolks just to break them up, then whisk in half of the sugar (6 tablespoons). Put the peanut butter in another heatproof bowl and set both bowls aside. 2. In a heavy nonreactive saucepan, stir together the cream, milk, salt, and the remaining sugar and put the pan over medium-high heat. When the mixture approaches a bare simmer, reduce the heat to medium. 5. Strain the base through a fine-mesh strainer into the bowl with the peanut butter and stir to combine. Set the container into an ice-water bath, wash your spatula, and use it to stir the base occasionally until it is cool. Remove the container from the ice-water bath, cover with plastic wrap, and refrigerate the base for at least 2 hours or overnight. 6. Freeze in your ice cream machine according to the manufacturer’s instructions. 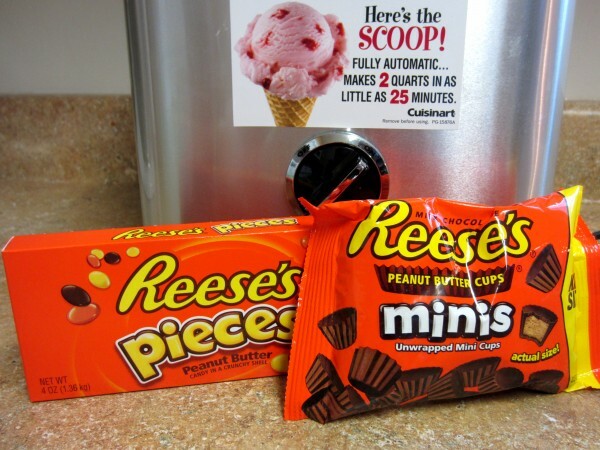 While the ice cream is churning, put the container you’ll use to store the ice cream into the freezer. 7. As you transfer the ice cream to the storage container, drizzle in some of the Fudge Ripple after every few spoonfuls of ice cream. Add any candy mix-ins if using. 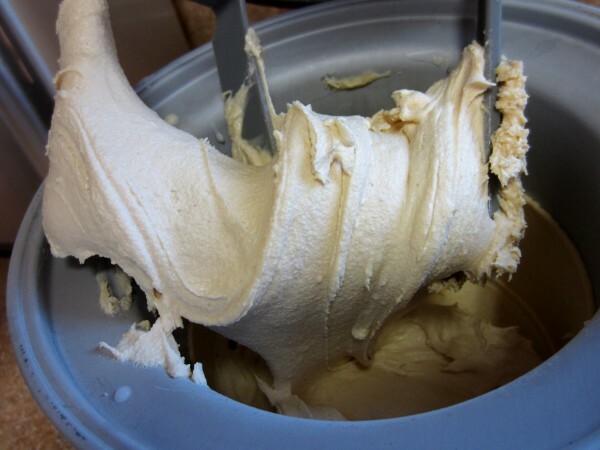 When all the ice cream is in the container, use a butter knife to gently swirl the mixture. Enjoy right away or, for a firmer ice cream, freezer for at least 4 hours. Yum! I may just have to add that book to my Christmas wish list. That looks so delicious and creamy! I love peanut butter in all sweet things! Thanks for sharing on Trick or Treat Tuesday!! !